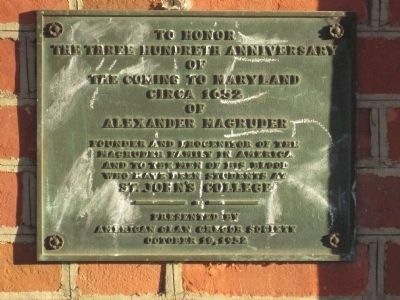 To honor the three hundredth anniversary of the coming to Maryland circa 1652 of Alexander Magruder, founder and progenitor of the Magruder family in America, and to the men of his blood who have been students at St. John’s College. In 1653, Alexander Magruder married Margaret Braithwait (1635-1671) in Prince George’s County, Maryland. They were Howard’s eighth great-grandparents. Alexander had been in Maryland for a little over a year and had already acquired land. Sometime within that time frame, he brought his daughter, Annaple, to Maryland. It is possible that Margaret Braithwait took the young child into her care. She was the daughter of Capt. William Braithwaite (1570-1649), and she was born May 9, 1635 in Hawkshead, Lancashire, England. As previously noted, William Braithwaite was “..a member of the First Assembly of MD in 1637; Commander of the Isle of Kent, in 1633 which was the earliest seat of the Proprietary Government of Maryland. He was acting Governor of the Province in 1644.”(1) Margaret was apparently the child of a first wife, whose name is currently unknown. William Braithwaite married Heleanor (Eleanor) Stephenson (b. 1614) in 1638 in Calvert County, Maryland. Col. Samuel Magruder I (1654-1711)–Howard’s seventh great-grandfather. He will be covered in the next article. John Magruder (1662-1685). John was born in Upper Marlboro, Prince George’s County, Maryland in 1662, and he died in 1685 in Calvert County, Maryland. He is presumed to have died unmarried. I have no other information about him. After Margaret’s death, Alexander married Elizabeth Hawkins (1634-1677) about 1670 or 1671. And here we run into a controversy. Some people believe Annaple was Elizabeth’s daughter. That is unlikely since Annaple was born in England in 1649 and Alexander didn’t marry Elizabeth Hawkins until 1670 or 1671 in Prince George’s County, Maryland. Some people believe he married a Sarah Hawkins, but I could find no record of that. It is possible that Elizabeth Hawkins’ full name was Sarah Elizabeth Hawkins or that Margaret Braithwait’s middle name was Sarah. I am inclined to favor the Elizabeth Hawkins’ connection with Sarah, making her full name Sarah Elizabeth Hawkins. Nathaniel Magruder (1675-1734). Nathaniel’s wife’s name was Mary. Their children were: (a) George Magruder; (b) Ann Magruder; (c) Elizabeth Magruder; (f) Mary Magruder; (g) Susannah Magruder. I do not have any dates for these people. Elizabeth Magruder (1676-1749). Elizabeth was born in Prince George’s County, Maryland. I have no additional information about her. She did not marry Col. Ninian Beall’s son, Ninian Beall, Jr. Some people believe that she did. by Patent & Conveyance Eight hundred Acres of land. two Pattents called Alexandria & Dumblain to them & their heirs. 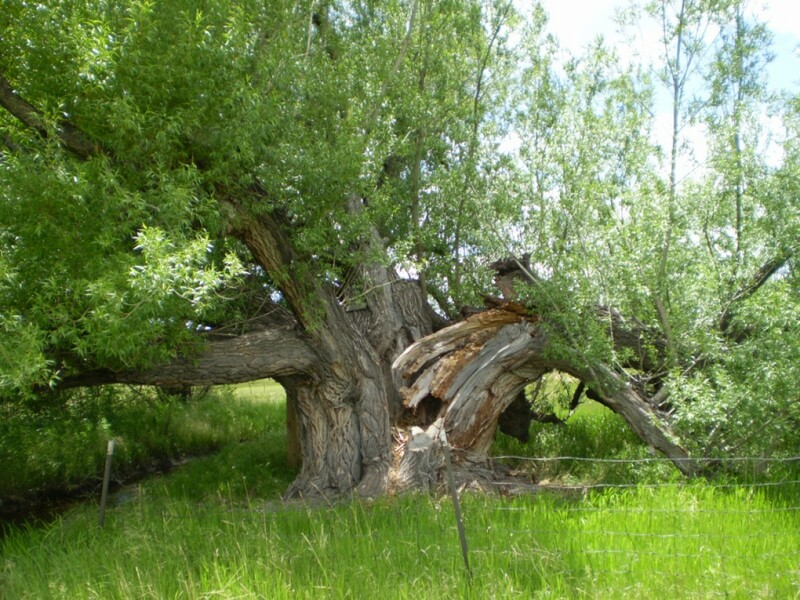 lying in the Westerne Branch called Good Luck to him & his heires forever. age of Twenty years & to my daughter Elizabeth at the day of her marriage. age of this my last Will & testament I request my Well beloved friends Mr.
[Note: “Mr. Ninian Beale” mentioned as an overseer of Alexander Magruder’s Will was Col. Ninian Beall. And thank you for pointing me in the right direction. My husband and I spent seven summers in Pennsylvania. I did doctoral studies in Indiana, PA from 1992-1998. He discovered Beallsville our first summer there and introduced me to it. We drove out to the country to see the stone house Zephaniah built. (There was a log house in Beallsville he also built.) The owner of the stone house told us Zephaniah and his wife were buried back in the woods. The only time to see their graves was during the winter because the rattle snakes were so bad. If there was a (Sarah) as a wife……where was she buried? It states above that Margaret and Elizabeth were buried at Anchovie Hill per Alexander’s request but no mention of Sarah. Francis Warmans plan, and then to plan, of William Ijams. To son Francis, residue of real estate. To dau. Mary, wife of John Watkins, personalty.